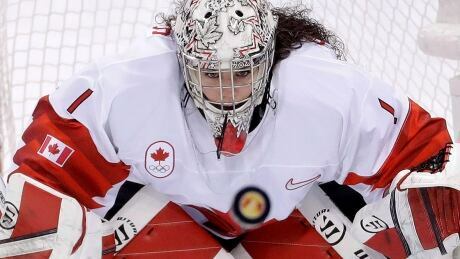 Marie Philip-Poulin and veteran goaltender Shannon Szabados headline Canada's roster for the Four Nations Cup women's hockey tournament. Poulin and Szabados were among 23 players named Thursday to the team that will compete Nov. 6-10 against the United States, Finland and Sweden in Saskatoon. Canada's team was chosen from 59 players who attended a September camp in Dawson Creek, B.C. Fourteen players who won an Olympic silver medal in Pyeongchang, South Korea, in February, will don the Maple Leaf again in Saskatoon. "This will be a good test for our players and program as we enter into a new four-year cycle leading into the next Olympics," said Hockey Canada director of women's teams Gina Kingsbury in a statement. "We have a committed and determined group of players looking to establish themselves as the top hockey nation among the best nations in the world," Kingsbury said. "The Four Nations Cup in Saskatoon will be an important measuring stick for us this season and leading into the IIHF women's world championship next April." His assistant coaches in Saskatoon will be four-time Olympian Caroline Ouellette of Montreal, Doug Derraugh of Arnprior, Ont., and Troy Ryan of Spryfield, N.S.